The Cape Charles Farmers Market Reopens on May 1st. The Cape Charles Farmers Market will again run every Tuesday afternoon at the Cape Charles Museum and Welcome Center, 814 Randolph Avenue. The market will be weekly through August 28, and then every two weeks from September 11 through October 30. Many returning vendors and some new vendors will be offering 100% local seasonal fruits, vegetables, herbs, flowers, seafood, eggs, pastured chicken, lamb, and pork for your fresh food shopping needs. The Market also offers selections of prepared foods, including barbecue, breads, sweet and savory baked goods, chef-prepared ready-to-eat salads and take-and-bake seasonal dishes, honey, jams, and more delicious offerings for your table. 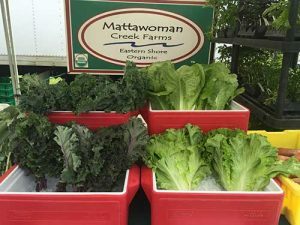 The Cape Charles Farmers Market is increasing its number of ready-to-eat and fresh food vendors. Each week we expect 15 to 20 vendors offering a wide variety of local food products. With limited space, craft vendors will be featured at special markets in November and December. The Market gladly accepts SNAP/EBT and Senior Nutrition Vouchers.